Dare I say it, no one knows color the way Boysen does. 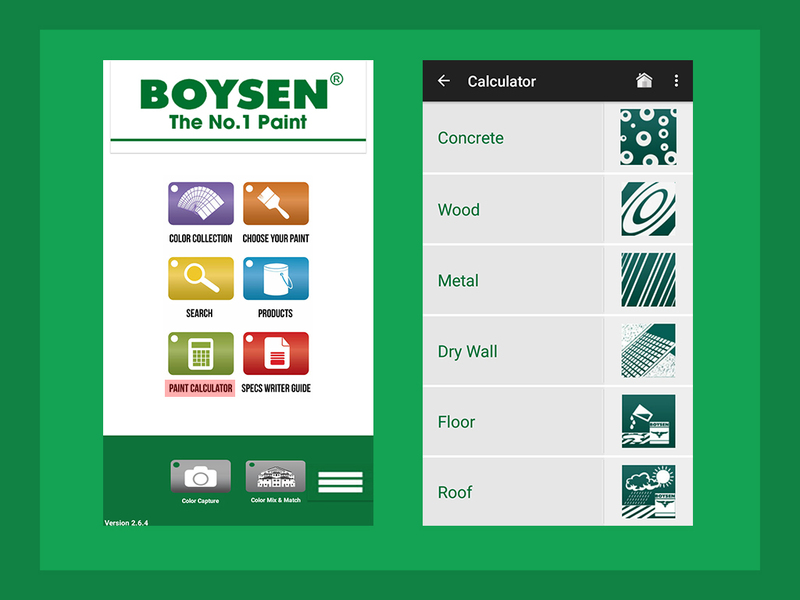 Boysen knows you, and what you need. Back in 2015, the Company was able to develop an app that guides users through all the painting know-hows. It was designed with the primary purpose of helping customers more easily identify the colors they want for their homes and gain access to product information offline. Much to the company’s delight, the application earned praises from homeowners and construction professionals alike. The positive reception inspired the company to add another helpful and fun feature that lets users play dress up on their living spaces which was introduced to the public later that year. It can get a little confusing, especially when you’re not the techie type. That is where we come in! 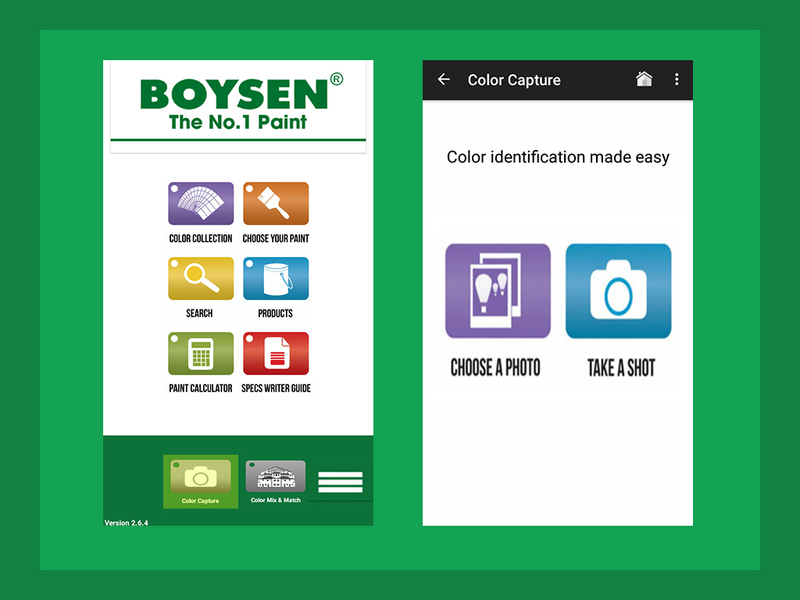 Here’s a step-by-step guide on how to maximize the use of the BOYSEN app. 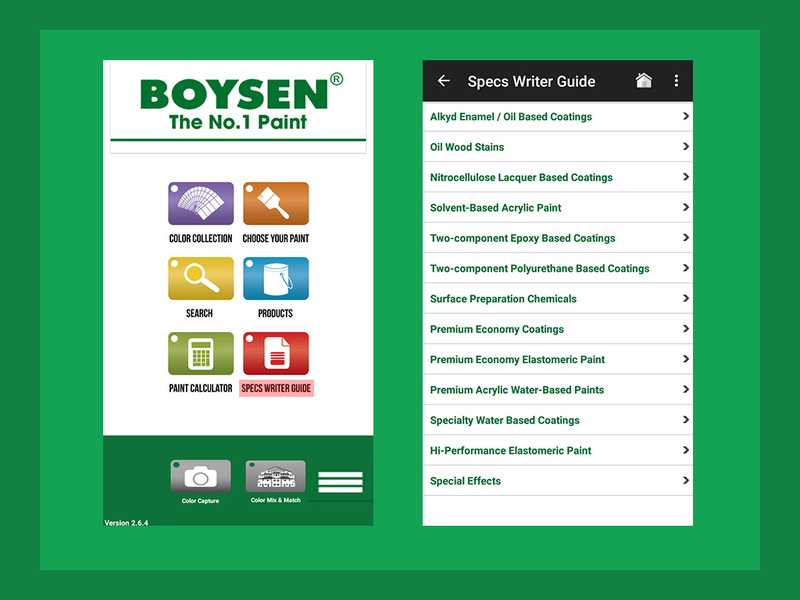 First up, look for the Boysen app on App Store or Play Store. Once you’ve found it, download and install it on your phone and let the magic happen. Got it? Let’s GET STARTED. Color Collection offers you the easiest way to browse through up to 4000 different colors for mixing. The colors are grouped for convenience. Say it’s your first time to paint, it can be hard to choose which is which. The Choose Your Paint feature helps you pick the right paint system from a number of alternatives that works perfectly for indoors or outdoors. For example, you need to repaint your bedroom walls: Click Concrete > Interior > Repainting. From there, click any of the suggested products to consider their features and benefits according to your assigned budget. After this, the app will direct you to a page where you can read on specific application instructions. You can also view some of the suggested colors of your chosen product. This is your quickest way to explore our wide array of products and colors. Users find this feature very useful as it saves them time and effort. Simply key in the name of your desired product or color and you’re on to your next step. 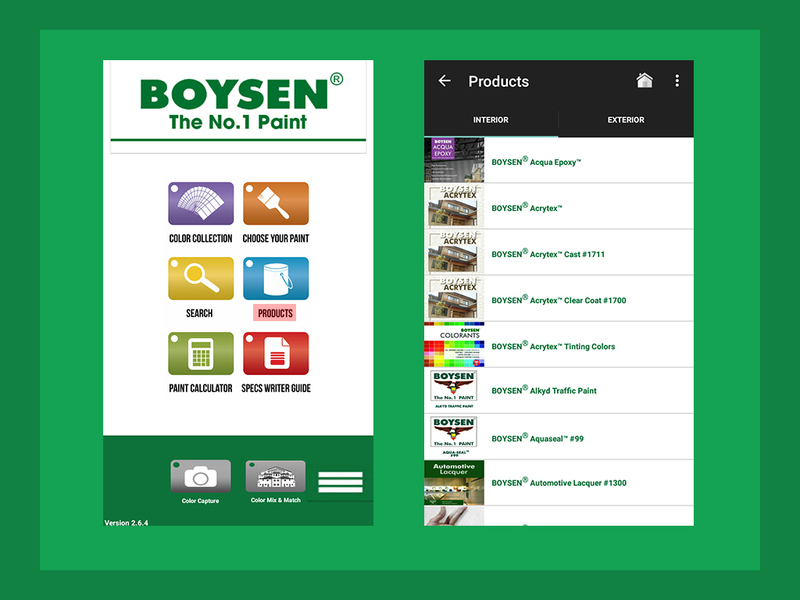 Here we see all of Boysen’s product offerings! Paints, primers, putties, fillers and other construction chemical solutions are segregated into either interior or exterior use for effortless selection of the product that fits your need. Each product has its own unique feature so it is best to read up on it before heading to your local hardware store. 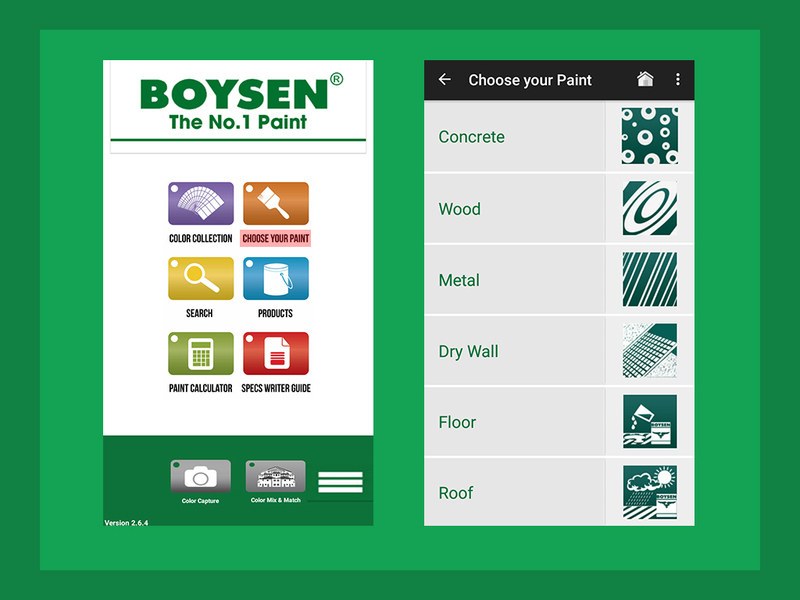 After measuring the total paintable area, open the app and look for the Paint Calculator. It helps you compute the amount of paint you need so you can skip the worry of buying too much or too little. Just click on the specifics (type of substrate you are painting, whether interior or exterior, and the product you chose) and input the total paintable area in square meters. Paint Calculator lists the amount of products you will need in liters which you can scale up to a more convenient packaging size, as available. This feature is also found in Choose Your Paint. In simple speak, this is arranged like the product manual. Specs Writer Guide emphasizes the different generic specifications as commonly listed in project documentations and the equivalent products available for easier identification. This is especially helpful for professionals/writers or anyone who needs a more generic description of the paint product. Say you’re casually walking down some random alley and come across a color that strikes your fancy. All you have to do is Take A Shot using Color Capture, click on the picture, and it will instantly give you the closest color match from the available selection. You can also use existing pictures from your phone gallery- just click on Color Capture > Choose A Photo and it will direct you to your photo collection. From there, follow the same instructions and get the closest color match. The colors vary depending on the area you click on the picture. Note: These colors may not exactly match the actual paint. It is recommended to view the actual paint swatch before making a purchase. Remember playing dress up as a child? The same way you have a clear vision of how you want your doll to look like, I’m sure you have always imagined how your dream home would be. 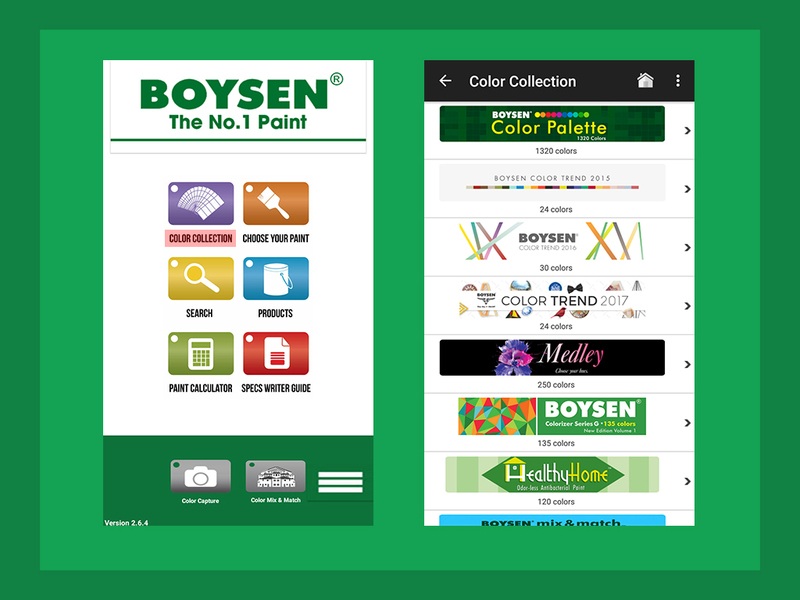 With the latest addition in the Boysen app, Color Mix & Match helps you catch a glimpse of your dream home. Simply choose from Boysen Permacoat Latex Paint, Titan Superflex Elastomeric Paint, Virtuoso Silk Touch and Boysen Healthy Home, then specify whether you are using it for interior or exterior. (Remember that Virtuoso Silk Touch and BOYSEN Healthy Home are strictly for interior use only.) You can either Take A Shot or Choose A Photo from your phone gallery to use for the mixing and matching of colors. To start, choose up to three colors you want your digital home to have. You can always change it anytime. There are two “brushes” you can use, Paint Mode and Poly Mode. Use the latter for bigger areas. Hey you, don’t worry about making mistakes! The app has a built-in eraser and undo (or redo) for pressure-free painting. For finishing up, you can zoom it in to add little details or to correct any error that would be harder to find if you’re looking at a wider picture. Finally, click on the upper right corner to save your finished project. A three-striped button on the lower right corner of the app features the company’s contact details from different offices ready to serve you. 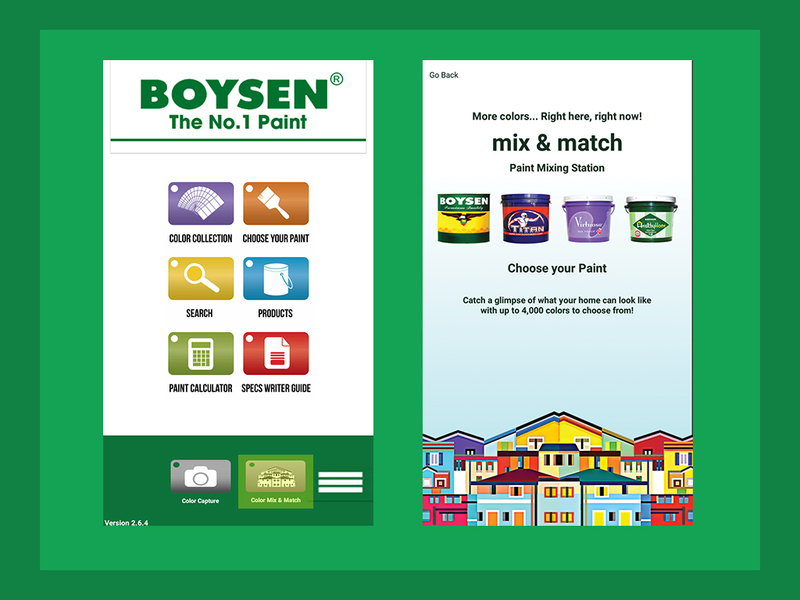 It also has a brief background of Pacific Paint (Boysen) Philippines, Inc.
You can also see an FAQs option in which the app answers specific questions about common painting problems or painting in general. Oh, and if after exploring the app, you suddenly want to be a part of Boysen’s growing family, the app has a nook especially made for business opportunities and concerns. Friendly reminder: Once you find your perfect color match, it’s important to view the actual swatch at the nearest Mix & Match station in your area before having a batch mixed. Find the branch nearest you by clicking this link. Do apps, gadgets and tech turn you off? Read about the analog version on how to choose your paint colors, and click on 3 Steps to Get the Closest Color Match.